The debate over whether or not to tip will soon be a thing of the past for diners in Jinan City, China. That’s where the country’s first robot restaurant recently opened. 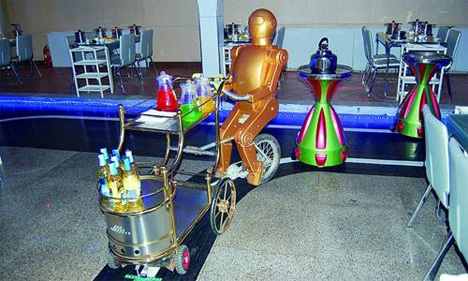 The eatery features a “staff” of more than a dozen robots that serve food and drinks, dance and entertain customers – and they never get tired or annoyed, or even try to manipulate a bigger tip with empty compliments or corny jokes. To balance out the robot staff, there are also some human hostesses and servers. Together, the staff can handle about 100 customers at a time. It may seem dangerous to have robots running around in the same space as meat-based life forms, but the ‘bots all have sensors that tell them to stop when there is an obstacle (like a person) in the way. The actual serving abilities of the robots are a bit limited. They aren’t able to take down orders or refill drinks; rather, they offer trays full of food and beverages for customers to choose from. What they lack in agility and personality, however, they more than make up for in entertainment value. 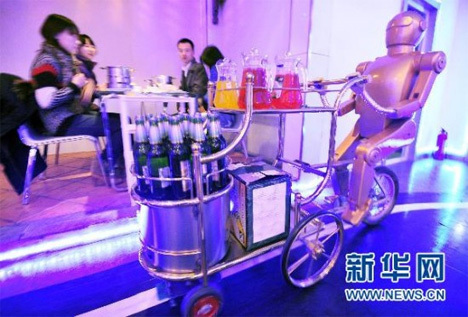 The owners of the Dalu Robot Restaurant believe that customers will keep coming to their establishment because of the novelty involved in being served by mechanical minions. With each ‘bot costing around $6000 to build, the restaurant would need to serve quite a few trays of food to stay in the black. 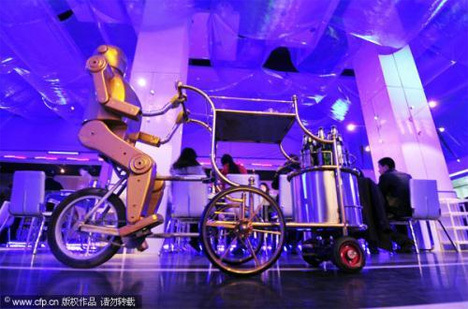 But as the company behind the restaurant points out, the robot waiters have much better attitudes than human ones, making them the perfect employees. See more in Robotics or under Technology. February, 2011.